It is rated for an advanced beginner and at that point I was definitely what you’d class as a total beginner. But I’m nothing if not stubborn. Besides, I’d borrowed a sewing book from the library. What could go wrong? 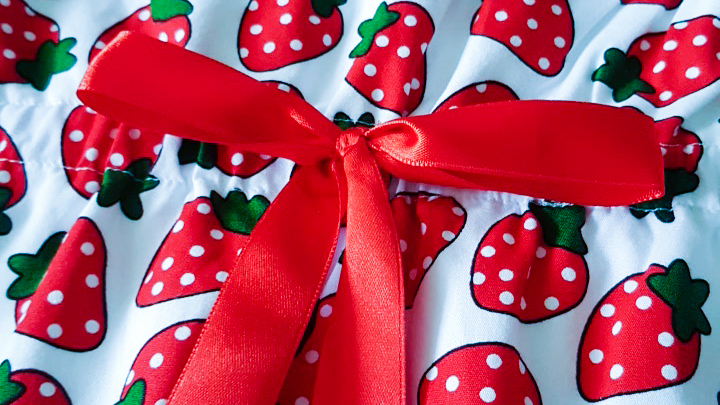 I used this sweet strawberry fabric from Fabric Land and dug the polka dot fabric and bias tape out of a stash of bits ‘n bobs I had picked up over the years. The dress is fully lined but I hadn’t accounted for that in my fabric buying so I re-purposed an old cot sheet , which did the job nicely and was lovely and soft. I made the size 6, according to Amelia’s measurements, and it was a really good fit with room to grow. She is tall for her age so rather than hem the dress, as per the pattern, I opted to use bias binding and give it a little bit longer wear. The dress has only recently been relegated to the ‘too small’ pile and it was a firm favourite of Amelia’s for a long time, so much so that I’ve since made a second one in the next size up. The Oliver and S patterns are well-known for their comprehensive instructions and the Roller Skate Dress pattern is no exception. Thank goodness, because I hadn’t a clue! Every step is clearly explained with good illustrations and lots of hints to help you successfully complete your garment. It was an enjoyable first project and spurred me onto making more complex garments and even to sewing for myself, some of which I’ll be sharing over the next few weeks. There’s nothing like setting yourself a challenge, is there? It’s the best way to learn! This dress is gorgeous – I love the combination of the strawberries and polka dots.